Kakao Bank revealed its plan of carrying out IPO (Initial Public Offering) in 2020 and it also predicted that it will be able to make a turnaround before 2020. Co-CEOs Lee Yong-woo and Yoon Ho-young of Kakao Bank showed their confidences in making a turnaround before 2020 and announced that they will be preparing for IPO starting from next year at a press conference that was held at The Plaza Hotel on the 26th for Kakao Bank’s 1st year anniversary of its foundation. Kakao Bank is preparing for IPO to expand its business foundation for faster growth speed. Its goal is to start preparation in 2018 and carry out IPO in 2020. 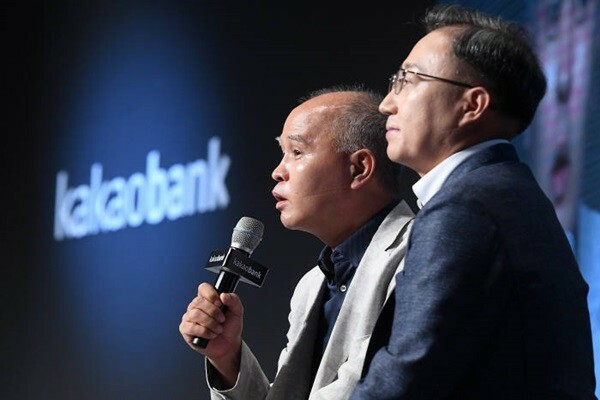 They also announced that Kakao Bank will not nee additional capital increase before 2020 since they believe that $1.16 billion (1.3 trillion KRW) that they have gathered through two recapitalizations will be enough for the next two years. “Although additional capital increase may be needed depending on integrity of loans for customers, we believe that we will not need additional capital increase after looking at speed and size of our current business.” said CEO Lee. They also expressed that internet-only banks will start to innovate much faster due to easing of banking and commerce regulations that is expected to pass by The National Assembly by end of this year. They chose ‘catfish effect’ as the one that has brought innovations throughout banking industries. “After we launched our service, current banks have started to launch comprehensive banking applications from customers’ perspectives rather than their point of views.” said Co-CEOs Yoon and Lee. They also revealed their future plans as well. They are going to start South Korea’s first foreign wire transfer service that does not require account numbers in the first quarter of 2019. Commission of this service will be 30 to 70% lower than that of other banks. Kakao Bank is also going to introduce loan programs for low-credit and medium-credit people based on its own credit data sometime during the first half of 2019. It is going to gather such data from Kakao Taxi and its other services and by working with Lotte Group. By combining and analyzing these data, it is going to enhance its credit evaluation model. It is also going to launch a loan service that allows customers to select their own loans. However, they could not promise when they are going to launch mortgage loan service and credit card.